The semiotic dynamics that each chapter discussed produces a complex “patchwork” of themes embroidered by grasping a holistic and cultural approach of human existence. 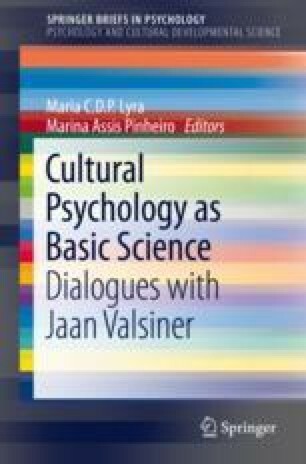 Considering Cultural Psychology of Semiotic Dynamics (CPSD) as an epistemological-theoretical and methodological arena of transdisciplinary, seeking for reconstructing the hermeneutics of human singularity and its differentiation from natural sciences, it is inevitable the construction of “new” (or, more critically, old challenges) such as generalizable mechanisms/processes in a grammar that overcomes the mainstream vocabulary centered in a problematic individualistic and causal perspective. We have chosen in this concluding chapter to point out two standpoints in order to foster new discoveries based on abductive logic: (a) the methodological challenges posed by the abstractive process of meaning construction and (b) the challenges faced by this abstractive process regarding memory and imagination.